Slice each chicken breast in half and horizontally and lightly pound until ½ inch thick. Combine the mozzarella and provolone cheese in a bowl and set aside. In a separate bowl whisk together the eggs and flour until smooth. 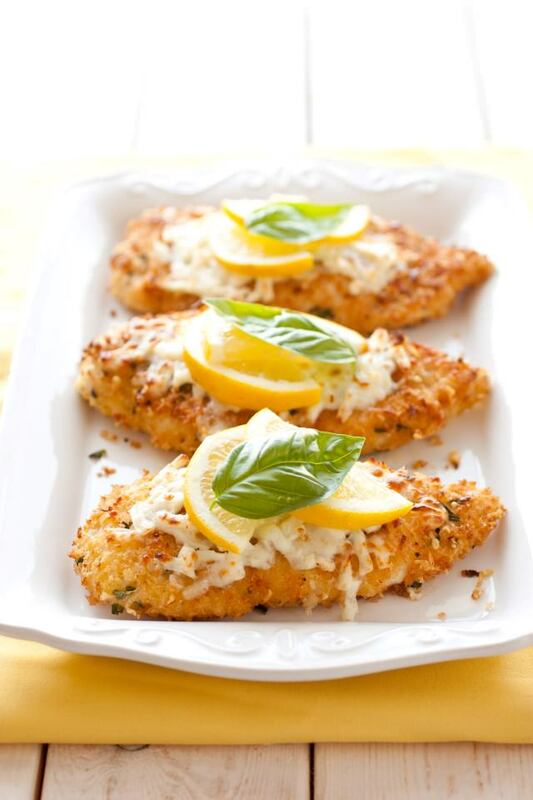 In a separate dish, combine the breadcrumbs, romano cheese, oregano, lemon zest and garlic powder. Dip each chicken into the egg mix and then press firmly into the breadcrumb mix, ensuring full coverage. Heat the oils in a large skillet and seal off the top and bottom of each chicken piece until golden brown. Transfer the chicken to a baking sheet and top with the mozzarella mix. Bake until the chicken is cooked through, about 12 minutes. Remove from the oven and garnish with lemon slices or wedges.